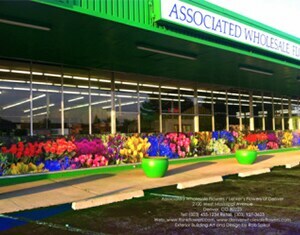 Associated Wholesale Florist proudly serves the Denver area and is open to the public as well as to florists. Our enormous retail space boasts an extensive selection of fresh flowers and greens contained in expansive walk-in coolers. We also offer several thousand square feet dedicated to vases, containers, and floral design supplies. Our customers are important to us and our friendly staff is dedicated to making your experience a pleasant one. Whether you're shopping for flowers by the stem or by the bunch, Associated Wholesale Florist is here to provide all your bulk wholesale needs. Stop by and visit us anytime at 2100 W. Mississipi Avenue, a 30,000-square foot warehouse shared with our sister retail floral operation, Lehrer's Flowers. Make Associated Wholesale Florist your first choice for farm-fresh wholesale flowers.